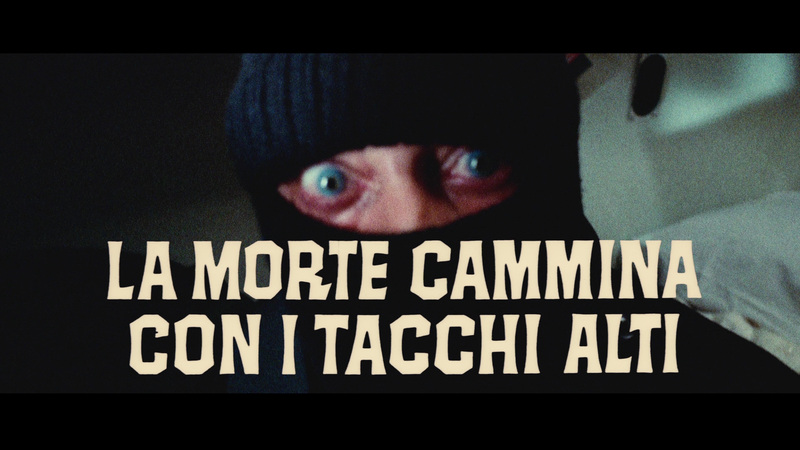 Death Walks on High Heels (aka La morte cammina con I tacchi alti) plot synopsis: Jewel thief Rochard is savagely murdered while traveling across country on a train, but his murderer fails to find the diamonds Rochard has stolen. 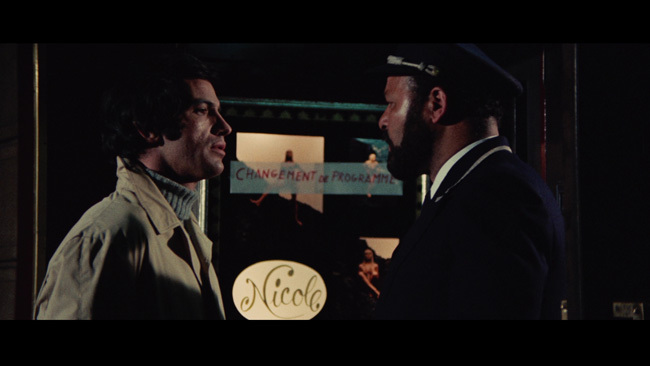 Cut to Paris, where Rochard’s daughter, Nicole, is being interrogated by the police. She insists she knows nothing about her father’s nocturnal affairs, but that doesn’t stop the killer, who believes she knows where the diamonds are, from leaving her threatening phone messages or breaking into her apartment to terrorize her. The killer sports bright blue eyes and a voice altered by an electrolarynx (a device used to help throat-cancer patients speak again). Later, when visiting her brown-eyed lover Michael, Nicole stumbles upon two blue contact lenses and comes to suspect that he is the killer. Fleeing him, she marries Dr. Matthews, whom she had met during a nightclub performance, and moves to England. But with marriage doesn’t come security, and soon the body count is piling up even faster than the red herrings. 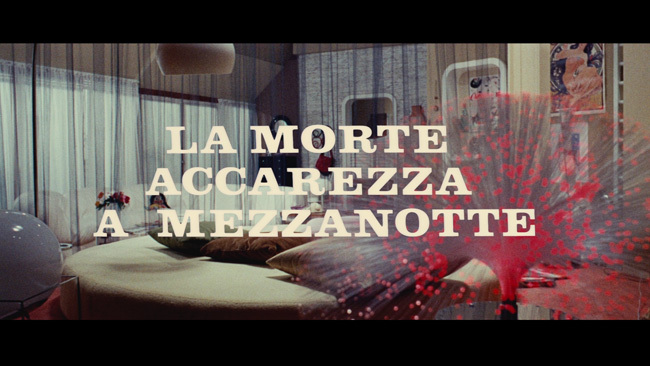 Death Walks at Midnight (aka La morte accarezza a mezzanotte) plot synopsis: After indulging in hallucinogenic drugs as part of an experiment at the behest of her boyfriend, Valentina imagines a terrifying murder committed with a spiked metal glove. Soon the incident becomes the basis of a news story, and it’s discovered that, a few months earlier, a woman really had been viciously murdered in the same apartment and her murderer never caught. Before long, Valentina comes to believe that she, too, is being stalked by the killer, but no one will believe her, including her traitorous boyfriend. Luciano Ercoli began his film career as an assistant director in the mid-1950s, but by the early 1960s he had turned to producing. 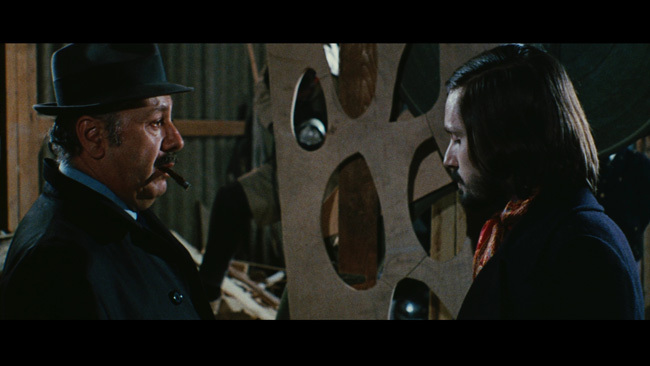 His career as director didn’t begin in earnest until 1970, nor did it last long, ending well before the decade was over, though it produced some notable, if not always great, examples of the giallo film, a type of thriller that often mixed elements of horror, mystery, and crime drama. 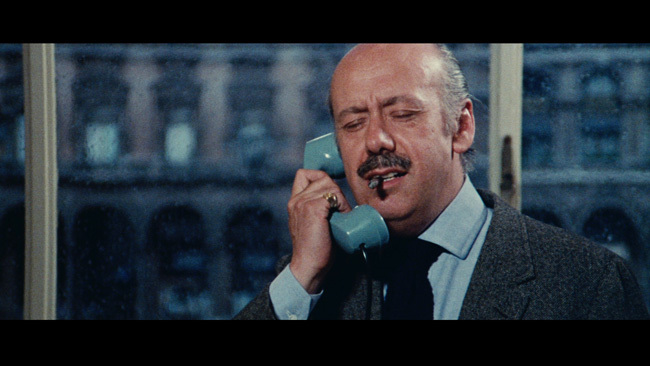 The term giallo originated with a series of paperbacks from Italian publisher Mondadori that bore yellow covers; the series included the works of Agatha Christie, Edgar Wallace, and Ellery Queen, among others. There were even juvenile giallis (the plural word for giallo), which included entries in The Three Investigators, Hardy Boys, and Nancy Drew series. Ercoli’s first giallo, The Forbidden Photos of a Lady above Suspicion, which he also edited and produced, was written by Ernesto Gastaldi from a story by Gastaldi and “May” Velasco. Gastaldi had already established himself, having contributed to the formation of both the Spaghetti Western and the Italian Gothic horror film. As he moved into the ‘70s, he proved a leader in the giallo film as well. Ercoli, meanwhile, cast his wife, Nieves Navarro, in an important role in Forbidden Photos, and a filmic triumvirate was born. 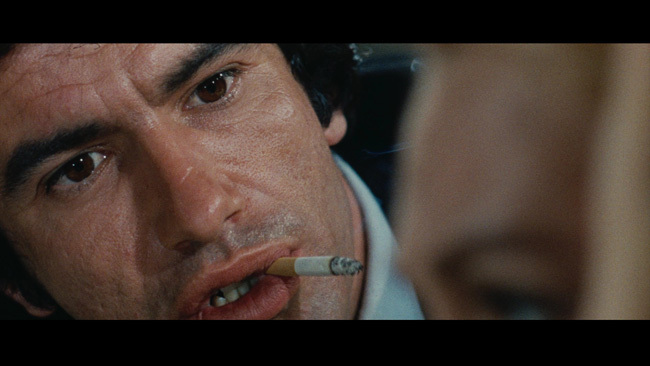 The next film to involve a collaboration of the trio was Death Walks in High Heels, with Navarro being placed front and center, at least during the film’s first half. High Heels focused less on horror and more on mystery and crime detection, though with a couple of striking moments of violence. Many critics have blasted the film for being pretty but convoluted and nonsensical. It’s convoluted, yes, though it makes sense, even if it’s a twisted kind of sense. That doesn’t make the film perfect, however; it retains some serious problems not the least of which are too many sequences involving Navarrao dancing in skimpy clothes, and the film is about half an hour too long, with a few too many twists and turns for believability’s sake. The performances are generally solid, and a scene in which a central character has her throat slashed and her mouth carved into a hideous frown is shockingly realistic. 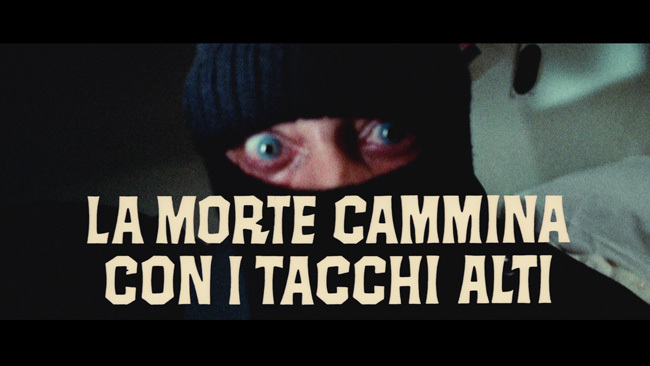 Ercoli, Gastaldi, and Navarro’s next giallo, Death Walks at Midnight, was released the following year and was considerably better, thanks to a tighter script and an increase in the horror quotient. Much of the cast returned as well. Clearly influenced by Dario Argento’s The Bird With the Crystal Plumage, which had proved an international success in 1970, Death Walks at Midnight ups the ante on violent encounters and spraying blood, going for a sleazier and more immediate feel than its predecessor, which is helped by the fact that the action isn’t restricted to Paris, London, and the picturesque British countryside. Another helpful aspect may be that Midnight is faster paced and shorter than Death Walks on High Heels. Both films offer a great deal of entertainment value, and neither is dull. 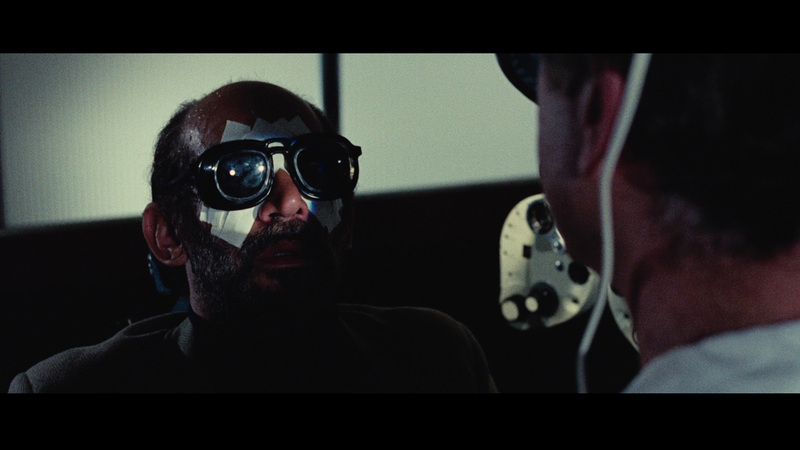 As long as viewers go into them knowing what to expect, there shouldn’t be any surprises, at least not the kind that will turn discerning lovers of the giallo film off. Given that Death Walks on High Heels and Death Walks at Midnight have almost identical tranfers, it seems fitting to describe them together. Both have been given new 2K transfers from original materials, and both feature an MPEG-4 AVC encode in 1080p high definition. They are also presented in their original theatrical ratios of 2.35:1. While High Heels has a slight edge over Midnight, both sport an exceptionally high level of detail. Interiors and exteriors alike are incredibly crisp and sharp. Grain is mostly organic; the only instances in which it isn’t are during a couple of darker scenes in Midnight, where black levels degenerate very briefly into crush and grain becomes a little excessive. Considering how brief these shots are, however, this is a very minor quibble in an otherwise gorgeous presentation. 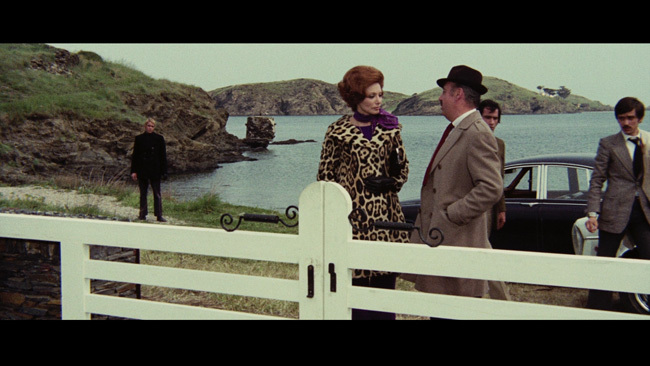 Colors are deep and rich, bringing the films close to the look of a 1950s Technicolor epic from a major studio than the small Italian thrillers they are. And finally, there is no print damage; scratches are nonexistent, and dirt and debris are few and far between. There are also no issues with compression, despite the high number of extras. In their place is a beautifully filmic look that belies the movies origins in the early 1970s. Fans who are familiar with the domestic DVD releases of these films will appreciate just what an upgrade these Blus are; and people who have never seen the films before are in for a visual treat. 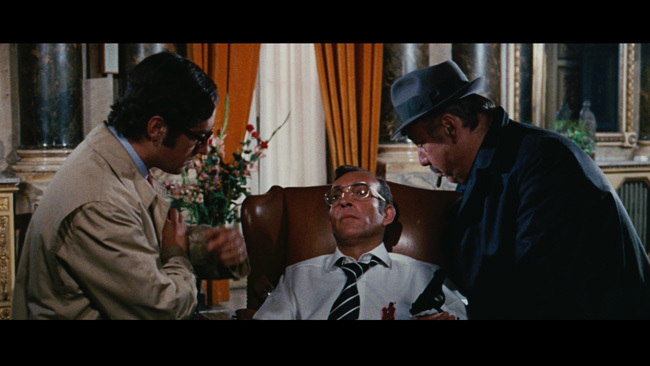 Both films also come in Italian-language and English-dubbed versions. The Italian-language versions contain Italian credits, whereas the English-dubbed versions contain English credits, both with some anglicized names (including Nieves Navarro credited as Susan Scott). 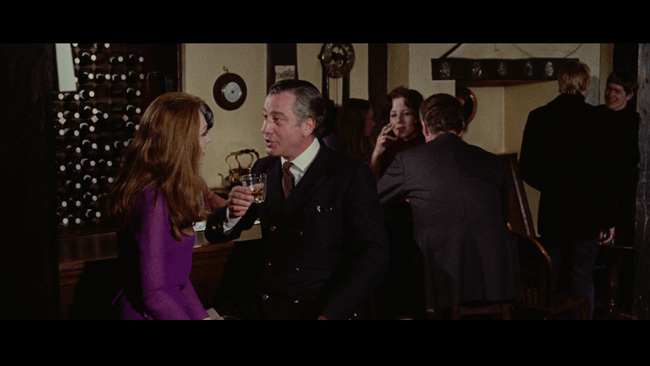 The onscreen English title for Death Walks on High Heels is Death Stalks on High Heels. The onscreen English title for Death Walks at Midnight is Cry Out in Terror. English subtitles are provided for all versions, and if they so choose, viewers can watch either version with either soundtrack. Speaking of the soundtracks, they are provided in DTS-HD Master Audio Mono and sound quite good, though it should be noted that the score on the Italian track is considerably louder and more garish than that recorded for the English track, which is lower and slightly more subdued. Both films contain audio commentary by film historian Tim Lucas, who discusses Ercoli’s history and directing style, describing him as a “carpenter” as opposed to an “artist,” in addition to the background for various cast and crew members, from the primary cast to some of the most obscure crew. 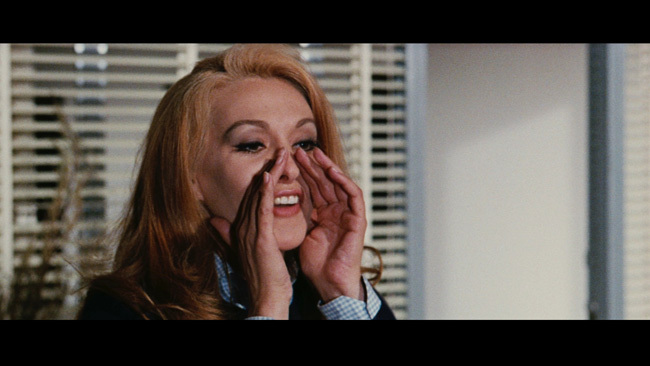 He also dissects each film’s script and character motivations. 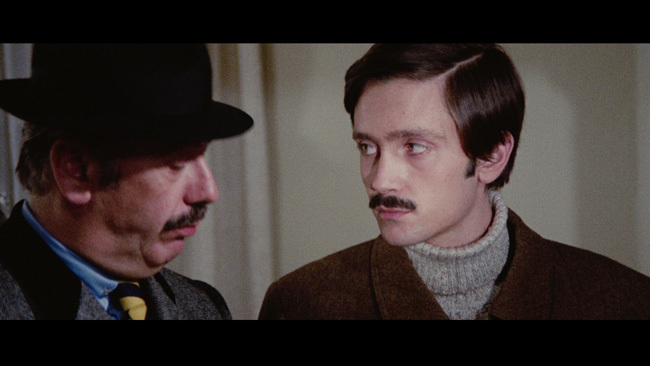 Writer Gastaldi offers a short introduction to each film, which is spoken in Italian with optional English subtitles. Both are approximately two minutes in length and offer insight into the world in which the films were made. 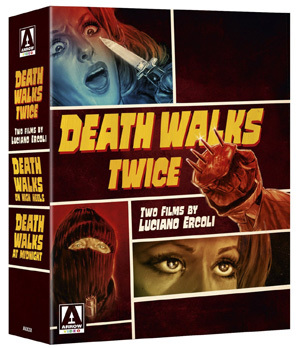 As is usual with these double-feature box sets, Arrow Video has loaded its Death Walks Twice with ample special features. Death Walks on High Heels features a number of interesting extras, beginning with “From Spain with Love.” Director Ercoli and leading lady Navarro discuss their work together from their home in Barcelona in an interview recorded in March 2012. The featurette runs a little over 24 minutes, with each subject interviewed separately. They discuss their respective careers as well as their marriage (their relationship didn’t start off well, Navarro reveals with a sly smile). The featurette is recorded in Spanish with optional English subtitles. 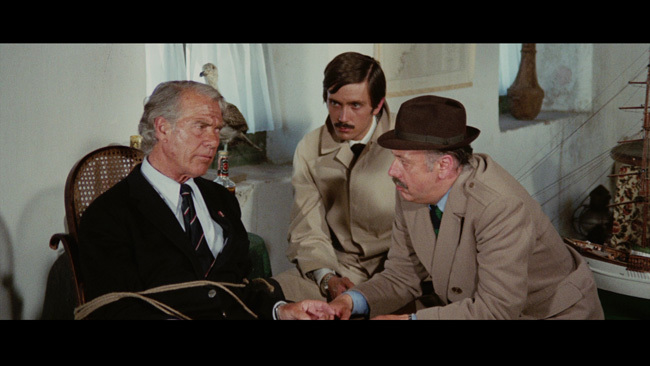 “Master of Giallo” is a new interview with screenwriter Gastaldi, filmed in Rome in 2015. Here he discusses his work on giallos, including Death Walks in High Heels, as well as his influences, the script for Once Upon a Time in America, and P.G. Wodehouse, among other things. The program may run a little over half an hour, but a lot of information is crammed into that relatively short running time. “Death Walks to the Beat” is a “new interview filmed in Rome in October 2015” with composer Stelvio Cipriani, who discusses his life in the movies as well as his work for Death Walks on High Heels; the interview is punctuated by scenes from the film. Cipriani speaks in his native language, with optional English subtitles provided. The interview runs just shy of half an hour. 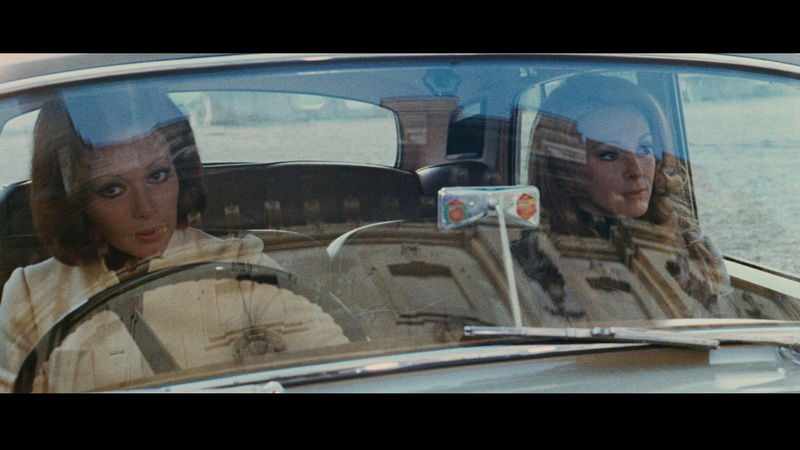 Rounding out the features on disc one are Italian and English trailers for the film. Together these run 5:38 in length. Note that the Italian trailer is slightly more graphic (in terms of violence) than the English trailer. 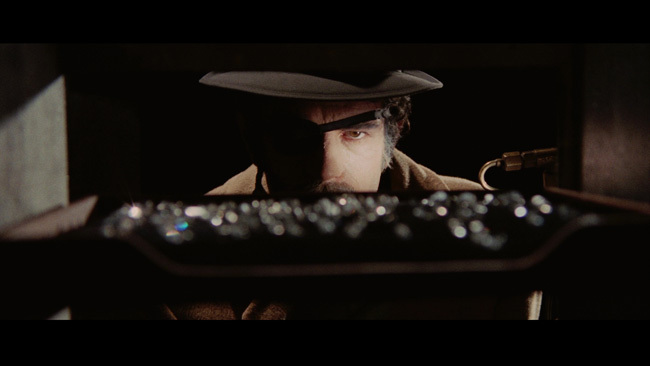 "Crime Does Pay" is an interview with writer Gastaldi, who expounds on some of the ideas touched on in the film’s introduction, as well as picking up where he left off on “Master of Giallo” (which is included with the previous film). He discusses his career in the film industry and touches on his over 60-year marriage, his flirtation with directing, his relationship with Ercoli, and his work in crime thrillers. Gastaldi is amazingly astute and infinitely fascinating, which makes the featurette an easy one to sit through. As with the introduction, the half-hour featurette is recorded in Italian but contains optional English subtitles. "Desperately Seeking Susan" is a “brand new visual essay by Michael Mackenzie” that runs approximately a half hour and deals with the three collaborative efforts between the husband and wife team of Ercoli and Navarro. Mackenzie also narrates the featurette. 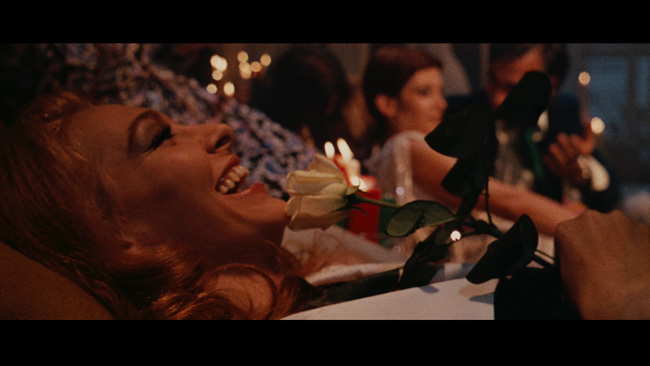 He explains the giallo’s fascination with sexual perversion wrought on women by the men they believe love them, a dichotomy made all the more obvious by the real-life marital relationship between the film’s maker and its damsel in distress. The Death Walks Twice box set is limited to 3,000 units. Death Walks Twice is another example of Arrow Video at its best. The box set features two entertaining films made available in multiple versions, with superior transfers and innumerable extras, all of which represent a labor of love. 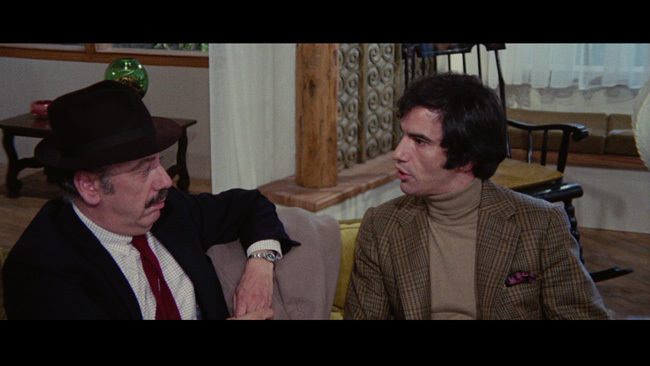 It’s hard to believe that anything about this set could possibly disappoint fans of the giallo or the horror genre, given how close to perfection it comes. Christopher Workman is a freelance writer, film critic, and co-author (with Troy Howarth) of the Tome of Terror horror-film review series. Volume 2 of that series (covering the 1930s) is currently available from Midnight Marquee Press, Inc., with Volume 1 (covering the silent era) due out mid-summer 2016. "some serious problems not the least of which are too many sequences involving Navarrao dancing in skimpy clothes"
I enjoyed DEATH WALKS IN HIGH HEELS much more than expected. It could have wrapped up 15 minutes quicker, but I was never tempted to reach for the FFW button. The mystery was compelling and the new characters and locals introduced halway through film kept it fresh. It never went long without some juicy exploitation elements either. I'm fairly new to Giallos but I'm sure this will remain one of my favorites as I continue my education. Thanks for the review.